Why Are Copiers The Better Option Than Inkjets, All The Time? Are you looking at buying a printer today? It would have been an excellent choice considering that a new printer would mean that it is working very well. The pack should not come with a problem at all. In fact, the printer will be used with no glitch or anything, until you realize that there is nothing much it can do. You bought yourself a printer and that’s exactly what you will be getting. There’s just a printer in the office and nothing more. A copier is a machine that comes with more than just one functions. In fact, it is a machine that helps you do four things at the same time without spending more for several other machines. It can be your personal fax machine from which you can send important documents through to your clients. The copier you got through the copier lease agreement is a machine that will help you turn hard copies into digital copies. Because it functions as a scanner too, you can easily make digital soft copies of documents that you have on hand. Not only does this make things easy,but it allows you to perform the tasks that you want to be done without needing extra help. Copies can be made through the copier. No matter what size of the document you need to make a copy of, you can expect this machine to deliver the documents right when you need them. All you need is to ask how it works and the leasing company would be glad to give you a lecture on how it could work to your advantage. A copying machine acts as a printer too. If you think that an inkjet would be a better fit for your business, then you better think again. 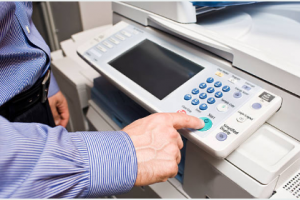 If you can have a copier that can serve as a printer,fax machine and as a scanner, then you know which of these machines is the better option.When you get a machine that serves more than one purpose, isn’t it more cost-effective? Why settle for an inkjet? When running a business, efficiency is always on top of your game. It should serve as your guide in making decisions. You can’t be choosing one machine over the other, especially when you know that a copier offers more than an inkjet. Although it may seem as if the inkjet is the better option because it is popular, being different is not always bad. In truth, when you are in business, you need to think about how you can be different. If you choose to go for a copier, you are choosing to be efficient in terms of cost and in terms of functionality. There is a lot to think about but there is no need to feel confused at all. You just need to see what you need and recognize that only copiers can provide it for you minus the cost.